HIPAVE (Heavy Industrial PAVEment design) is for the mechanistic analysis and design of flexible pavements subjected to the extremely heavy wheel loads associated with freight handling vehicles in industrial facilities, in particular, intermodal container terminals. Express Pace for Huge Freight and Rail Project! The southern half of the site with the North Island Main Trunk Line to the left. You may appreciate the sheer scale of this project by comparing it to a provincial town. Stand at one end and you’re hard pressed to see the other end without binoculars or x-ray vision: Pictures don’t do it justice. Befitting the world’s largest exporter of dairy products, the Fonterra dry store in the middle of the site is huge – half a kilometre long – too big in fact to fit on an A3 size drawing at 1:1000 scale! But then the Crawford Street Freight Village near Hamilton is seriously large! Some 20 hectares are being developed for freight storage, handling and distribution for its owners, New Zealand’s giant dairy co-operative, Fonterra, and freight transport and distribution company, Toll NZ. 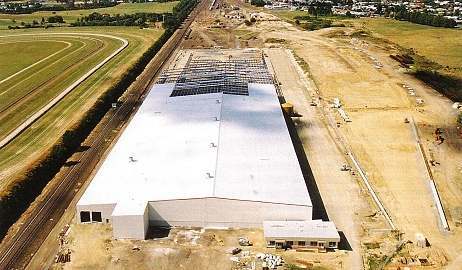 Fonterra required a large distribution depot for their dairy products, located where they could conveniently use either Tauranga or Auckland ports to export their goods. Toll NZ envisaged an adjacent container yard right next to the North Island Main Trunk line. The site in Te Rapa on the outskirts of Hamilton fitted the bill almost perfectly. It was almost dead flat- but it did however pose civil engineering challenges by being partly underlain by peat! The supporting infrastructure is equally impressive – hundreds of thousands of square metres of earthworks, drainage, roads, and heavy-duty pavements. Then there’s some 6 km of new rail track and a turntable for locomotives. It’s New Zealand’s biggest locally designed railway project in recent times – dwarfing the trackwork required for Auckland’s Britomart transport and urban renewal project. With axle loads of 130 tonnes designed for extended periods of operation and ability to stack full 40 foot containers three high, this is one serious pavement! It comprises a 1,600 mm thickness of compacted sand, lime stabilised GAP 65 aggregate, SMA (stone mastic asphalt) and a top layer of asphaltic concrete to finish it off. Duffill Watts Wellington’s Heavy Duty Pavement Specialist Ken Hudson was responsible for the final design that evolved from the conforming design and an alternative approach by the contractor. As well as using conventional methods and software (with almost 1,000 CIRCLY runs), the final design was a world first application of HIPAVE from Mincad Systems Australia, a state of the art layered elastic analysis design program specially for heavy duty pavements such as container terminals. As well as the main access road to accommodate B-Train vehicles, there are roads designed for 15 tonne forklift trucks, Mafi trailers and light vehicles. These use a combination of asphaltic concrete, stone mastic asphalt and chip sealing. Duffill Watts Auckland handled the engineering design with peer reviews by the Wellington and Whangarei offices. Duffill Watts Auckland handled the earthworks design and quantity calculations using MX, Land Desktop and AutoCAD software. We have just publishedHIPAVE – A Mechanistic Design Tool for Heavy-Duty Industrial Pavements – Wardle, L.J., Rickards, I. and Hudson, K. (2005) on how HIPAVE was used to design this project. On the premises of Container Terminal Hamburg-Altenwerder (CTA) HCCR built a new facility for storage and maintenance of empty containers. The pavement had to be designed to withstand loads of Reach Stackers and six (empty) containers on top of each other.